Osteoporosis gets a fair amount of attention in the news media. However, when most people think of this problem, they associate it with elderly women. It turns out that older men, young women, and even elite athletes can also develop osteoporosis. The medical community is starting to acknowledge that regular exercise is necessary to prevent health problems. However, in my opinion, even when physicians do recommend exercise to their patients, often it isn't clear what kind of exercise, or, how much is necessary. These details are important because too much aerobic exercise can actually promote osteoporosis. The purpose of this review is to summarize how much, and what type of exercise is beneficial for osteoporosis. Osteoporosis is a condition where the bones become porous and brittle, making them more susceptible to fracture. In fact, persons with osteoporosis can fracture vertebrae in their back simply by bending over. "Osteopenia" is a precursor to osteoporosis. According to the National Osteoporosis Foundation (www.NOF.org), an estimated 44 million Americans -- or, 55 percent of people 50 years of age and older -- either have, or are at risk for osteoporosis (10 million individuals already have the disease and almost 34 million more are estimated to have low bone mass). Of the 10 million Americans who have osteoporosis, eight million are women and two million are men. While osteoporosis is often thought of as an older person's disease, it can strike at any age. Significant risk has been reported in people of all ethnic backgrounds. Osteoporosis causes 1.5 million fractures every year in the US. As the US population continues to age, this number is expected to double by the year 2040. When analyzing research on osteoporosis, it is important not to confuse measurements of bone density with the rate of fractures. Even though fractures can and do occur spontaneously in people with very poor bone density, most bone fractures in the elderly are a result of falls. But, regular exercise also improves balance and muscle strength, thereby reducing the risk of falls. Note that the modifiable risk factors above can all be addressed with proper nutrition and the right amount of exercise. However, a 1998 survey of women ages 50-64 years revealed that less than half engaged in regular physical activity, and less than one-quarter obtained the recommended "30 minutes per day" amount (McTiernan A, et al. 1998). This is especially worrisome because the incidence of osteoporosis in the US is rising faster than expected based on the aging pattern of the population (Kohrt WM, et al. 2004). As mentioned above, men can develop osteoporosis, too. This is due, at least partially, to a decline in circulating testosterone levels as men age. Male athletes are also at risk. Distance runners who log 60-70 miles/week (MacDougall JD, et al. 1992) and male cyclists who trained and raced for 10-20 years with little to no weight-training (Nichols JF, et al. 2003) have poorer bone density than men who don't train this hard. Bone is a living tissue. Like muscle, bone responds to loads placed on it. "Trabecular" bone has a higher metabolic rate and is more responsive to exercise than "cortical" bone (Miller LE, et al. 2004). The lumbar spine is 65% trabecular bone, while the femoral neck (the end of the thigh bone that connects to the pelvis) is 75% cortical bone (Duchman RL, et al. 2006). Research shows that exercise improves bone density in the spine more rapidly compared to other bones (Nelson ME, et al. 1994). At least 6-8 months of regular exercise is necessary to observe a response. Unfortunately, the opposite also appears to be true: when exercise is excessive, bone density of the lumbar spine declines more rapidly than other areas of the skeleton (Bilanin JE, et al. 1989) (Hetland ML, et al. 1993). In one study, postmenopausal women from Germany were put on a comprehensive 2-yr exercise program that included walking, running, jumping, aerobics, strength-training (weights, weight-machines, elastic belts, isometrics), and flexibility. After 2 years, bone density in the spine and the legs was higher in the women who exercised compared to women who were not in the exercise program (Kemmler W, et al. 2004). Unfortunately, since these subjects participated in multiple forms of exercise (eg., aerobic exercise, strength exercise, and impact exercise), this study doesn't really clarify what type of exercise or how much is needed to reduce osteoporosis progression. A study of female college athletes (mean age at the time of the study = 20.7 yrs) shows that bone density was highest in athletes who participated in "high-impact" sports such as basketball and volleyball, compared to lower impact sports such as soccer and track, or to non-impact sports such as swimming. The soccer and track athletes also had better bone density than the swimmers (Creighton DL, et al. 2001). Researchers in Finland showed that "impact" exercises are also beneficial for the elderly. Their program included: jumping, feet stomping, dancing, stair-climbing, bench-stepping, knee-bends, leg-lifts, heel rises and drops, and balance exercises. They found that when elderly women (average age 73 yrs) did these exercises 3 times per week for 30 months, bone loss was slowed, though improvements were only seen in specific areas of the skeleton. Unfortunately, details such as how many minutes of stair-stepping or jumping per session, or, how far these subjects walked were not provided (Korpelainen R, et al. 2006). So, we are still left with uncertainty regarding what type of exercise and how long it should be performed. In this section, I will review specific types of exercise and summarize whether it was effective for preventing bone loss. One study showed that men (ages 20-59 yrs) who jogged 9 times per month had better bone density than men who jogged 1-8 times per month. And, both groups had better density than men who didn't jog at all. But, bone density in those who jogged 20 times per month was no higher than the 9 times/month group (Mussolino ME, et al. 2001). In another study, the bone density of high-mileage runners (60-75 miles/week) was lower than men who only ran 15-20 miles/week (MacDougall JD, et al. 1992). These studies help to clarify how much (ie., how often) someone should exercise since excessive running can lead to a decline in bone density. This topic is discussed in more detail below. When the arms of nationally-ranked squash and tennis players in Finland were evaluated, bone density in the dominant arm (ie., the one swinging the racquet) was higher than the non-dominant arms in these athletes. They trained an average of 4.4 times per week and an average of 80 minutes per day (Kannus P, et al. 1995). How can this be explained? Certainly, a squash racquet or tennis racquet doesn't weigh very much. 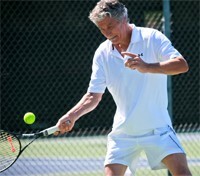 Perhaps it is because racquet sports are a type of "impact" exercise for the arm bones? Soccer is a good example of a sport that requires change-in-direction running. One study of teenage female athletes showed that soccer players had better bone density than either swimmers or weight lifters (Bellew JW, et al. 2006). Both programs required 1 set each of 13 different exercises using MedX® resistance machines. Each work-out session was performed 3 times per week for 6 months. At the end of 6 months, muscular strength improved substantially in both the low-intensity regimen and the high-intensity regimen. However, bone mineral density improved only in the femoral neck (hip joint) and only in the high-intensity group. The researchers stated that 6 months of weight-training may not be enough time to see improvements in bone density even though muscular strength increased (Vincent KR, et al. 2002). Women in the low-intensity regimen had to perform twice as many repetitions during each exercise compared to the high-intensity group. All women performed 10 exercises, 3 days per week for 12 months. At the end of 12 months, both groups had modest (0.5-1.0%) increases in bone density, but neither program was better than the other (Pruitt LA, et al. 1995). This suggests that elderly women don't need to lift large amounts of weight to stimulate bone density. However, in this study, subjects had to perform 3 sets of each of 12 exercises. That's a lot of reps (36) for each exercise in the high-repetition group, but, the amount of weight being lifted was low. After 6 months, neither group showed any improvement in bone density, even though muscular strength improved in both groups (Bemben DA, et al. 2000). • Pre-menopausal women and weight-training: Researchers at the University of Arizona had women ages 28-39 yrs perform weight-training for 18 months and compared their bone density to women who did not weight-train. Both groups were inactive and untrained when the study began. During the 18 months, the women who weight-trained demonstrated increases in bone density of 1.8-2.0% in their femur and 1.9-2.8% in their lumbar spine (Lohman T, et al. 1995). So what do these studies tell us? It is difficult to make recommendations regarding weight-training. Unlike muscular strength, there is no firm relationship between the amount of weight lifted and the bone density response. Also, increases in bone density take much longer to develop. In cultures where sitting on the ground is common, the rate of hip fracture is rare, even in women older than 65 yrs who have osteoporosis (Mayhew PM, et al. 2005). Is this because the act of standing up repeatedly strengthens the bones of the hip joint? Or, is it because their leg strength is better? Or, perhaps these people simply have better balance? Maybe the answer doesn't matter. The take-home point is that this suggests simple exercises like squats and leg press should be recommended for the elderly. • Cycling: Older male cyclists (average age 51.2 yrs) who had been training and racing for a minimum of 10 years were found to have lower bone density than similar-aged men who didn't cycle. Fifteen percent of the cyclists had very low bone density. Many of these cyclists had been training for 20 years or more and few engaged in weight-bearing types of exercise (Nichols JF, et al. 2003). In another study, when runners and cyclists were compared (cyclists didn't run, and runners didn't bike), runners showed increased bone density of the leg bones but cyclists showed decreased bone density of the spine (Stewart AD, et al. 2000). • Swimming: When the bone density of adolescent female swimmers, soccer players, and weight-lifters were compared, swimmers had the lowest value of the 3 groups. In fact, bone density of the swimmers was even lower than the "normal" value for the average adult (Bellew JW, et al. 2006). • Walking: Walking provides many health benefits for the elderly, but, some researchers don't believe it is very effective for osteoporosis. Walking does not "load" the femoral head, an area that becomes weak in older age and is susceptible to fracture when the elderly fall (Mayhew PM, et al. 2005). • Yoga: Yoga may not directly strengthen bone, but it is still beneficial for the elderly in that it improves the strength of leg and torso muscles and improves balance, both of which may help to reduce the risk of falls, a major cause of hip fracture. CAN REGULAR EXERCISE PREVENT THE DEVELOPMENT OF OSTEOPOROSIS IN OLD AGE? In general, the answer is "yes", however, genetics appears to be even more important than exercise (Duchman RL, et al. 2006). Regular exercise -- at the right amount -- is critical for young girls. In young girls, growth spurt is nearly complete about 2 years after menarche begins. Bone mass of girls reaches a peak at around age 17-18 yrs. It is believed that regular exercise during teenage years establishes a better "baseline" which benefits them throughout the rest of their lives. In the study of Finnish squash and tennis players described above, it was found that bone density was enhanced if regular exercise was begun early in life: female athletes who started training several years before beginning menarche had better bone density than those who waited until later in their life (Kannus P, et al. 1995). However, too much exercise can have the opposite effect. In teenage girls, if exercise is so hard that amenorrhea occurs, then the bone-building process is suppressed at a very critical phase in their life. This condition, known as "exercise-induced amenorrhea," can lead to early onset osteoporosis, a condition from which that athlete may never fully recover. Menstrual disorders occur more frequently in female athletes than in the general female population. Amenorrhea (defined as 2 or fewer menstrual cycles per year) occurs in roughly 5% of the general population, but rises to 10-20% of vigorously-exercising women, and affects 40-50% of elite runners and professional ballet dancers (Marshall LA. 1994). Amenorrhea is associated with vigorous exercise in women throughout reproductive ages (Marshall LA. 1994). "Exercise-induced" amenorrhea, or, "athletic" amenorrhea, in turn, contributes to the early onset of osteoporosis. Female athletes who develop exercise-induced amenorrhea have a hormone profile similar to postmenopausal women. Thus, it should not be surprising that osteoporosis shows up in these premenopausal women as well. But are there any firm recommendations regarding how much exercise is needed to slow, and possibly prevent, the development of osteoporosis? The average person may have trouble translating these recommendations into an exercise program that works for them. For example, what does "moderate to high intensity" mean? The authors of this paper acknowledge that it is very difficult to categorize the optimum intensity of exercises that build bone strength. It turns out, it doesn't take much. Note the research mentioned earlier that showed that "foot stomping" exercises were beneficial in the elderly and swinging a tennis racquet improved density in the arm bones. And, in an animal study, it was found that when rats jumped down from a ledge, as few as 5 jumps per day produced an increase in bone strength, and more than 10 jumps per day did not produce further benefit (Umemura Y, et al. 1997). • For elderly: Weight-bearing exercises like squats and leg press appear to be the best for strengthening the bones of the hip joint. If these exercises are too difficult, or, if you don't belong to a gym, then simply practice standing up from a chair. Activities such as basketball are effective, but may not be appropriate due to the risk of falling and may simply be too strenuous. Walking really isn't very good for improving bone density, unless it incorporates climbing stairs, or walking uphill. To improve balance, try exercises such as BOSU ball, Tai Chi, and yoga. If these are too difficult, then practice standing on one leg. • Post-menopausal women: At menopause, bone loss accelerates. This is thought to be due to the abrupt decline in estrogen levels. Some researchers believe that women lose 20-25% of their bone density during the first 5 years after menopause begins. Thus, exercise during the first 5 years after menopause begins is especially critical. • Pre-menopausal women: Make sure your exercise program includes some type of impact exercise, or, a weight-training program that exercises the legs and the back. Don't exercise so much that you develop amenorrhea. • Pre-pubertal girls: Young girls need to participate in "impact" exercise (eg., basketball, gymnastics, volleyball), or sports that require abrupt changes in direction while running (eg., basketball, field hockey, lacrosse, soccer, tennis). • For distance runners: Keep the distance under 15-20 miles per week. If you run more than that on a regular basis, then add an impact exercise (basketball, soccer, tennis, volleyball) or weight-training to the weekly routine. • For cyclists and swimmers: Similar to the recommendations for runners above, add impact exercises and/or weight-training into your weekly program. Q: I am a premenopausal woman who developed exercise-induced amenorrhea and subsequently was told my bone density had decreased significantly. If I stop exercising so hard, will my bone density recover to where it should be for my age? ANSWER: In general, some degree of improvement is possible, though even after several years, and a measurable increase in bone density, your bone density may still be less than what it normally should be for your age. Individual responses will vary. • Exercise should be weight-bearing (squats, stair-climbing, push-ups, etc), resistance exercise, or "impact" exercise. Activities such as biking, swimming, Tai Chi, and even walking are not as effective as basketball, running, soccer, tennis, and volleyball. • Running does improve bone density, but can be detrimental if the weekly mileage is too high. This has been demonstrated in both men and women. • The benefits of exercise on the skeleton are limited to the specific area being exercised. You can't increase density of the hip and leg bones by doing arm exercises. These exercise guidelines are especially important for serious aerobic athletes (cyclists, swimmers) who don't weight-train or do "impact" activities. These guidelines are also important for women during 2 specific phases of life: (a) the 2 years just prior to menarche and (b) the 2-5 years following menopause. Hopefully, the information presented here will encourage more people, especially the elderly, to exercise regularly. 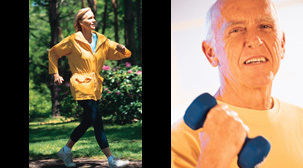 The National Osteoporosis Foundation (www.NOF.org) is a good resource for general information on osteoporosis. •Action Plan for Osteoporosis (Human Kinetics), by Kerri Winters-Stone, PhD. •Exercises for Osteoporosis by Dianne Daniels, MA. In 2006, Gatorade® introduced calcium-enhanced water: "Propel® Calcium Fitness Water" (www.PropelFitnessWater.com). On this web site is a 10-question quiz where you can assess your knowledge of osteoporosis, dietary calcium, etc. This web site is also accessible from the link www.BoneHealthEquation.com. • American College of Sports Medicine: Med Sci Sports Exerc 2004;36:1985-1996. • North American Menopause Society: Menopause 2006;13:340-367. Balance: An Overlooked Element of Fitness?